He's often seen in very little - someone had a major crush on him! He doesn't respond to any of the nuns - in fact, he's quite indifferent to them. The sexual tension between Mr. Dean (Farrar) and Sister Clodagh (Deborah Kerr) practically melts the screen! Also Dean has that line about the Sisters doing him a favor when they start to "educate" the young women of the village. The sexual innuendo was apparent. I'd love to claim the character... but in this case, I don't even see any sub-text to support it. I don't know - I see him as a closeted gay. But, hey, it's just me. Remember he brought the Jean Simmons character to the nuns, because she was bothering him - hanging out on his porch and putting flowers in her hair! He was also turned off by the runaway nun. As far as his relationship with the Deborah Kerr character, he tolerated her - and was amused by her, too. The young prince, the Sabu character, is quite gay - so it's a surprise to learn that he runs off with the Jean Simmons character. 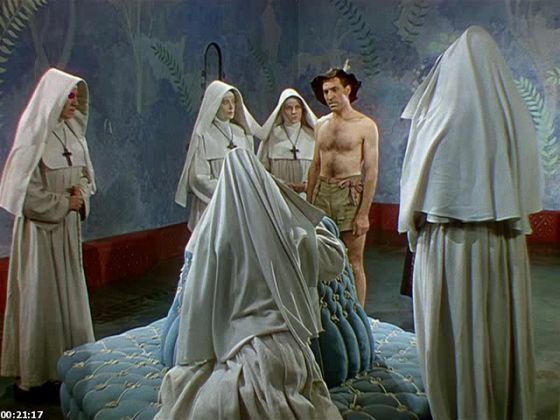 His gayest scene - when he explains why his handkerchief is saturated with the scent, Black Narcissus. I've always thought that Akim Tamiroff's character (Carlo Cibo) in Anthony Adverse is gay. "We shall drink to the past, forget the future, and pleasantly live the present!" Although nothing was ever said about his sexuality, I always thought that Frederick Fairlie in "The Woman In White" was delightfully gay. The character was played by John Abbot in an unforgettable performance. Is he checking out Mr Dean's shorts? Mr. Dean's legs were quite an enticement. A great performance indeed! Vincent Price does a version of it very nicely, (though not quite as perfectly as Abbot), near the beginning of The House of Usher. Abbot as Frederick Fairlie says something like this: "In the wretched state of my nerves, loud sound of any kind is indescribable torture to me." Price as Roderick Usher: "If you please... Mr. Winthrop...softly. An affliction of the hearing. Sounds of any exaggerated degree...cut into my brain like knives." I will have to see "The House of Usher". In terms of movies, The Fall of the House of Usher has been filmed many times. My favorite is the rather odd British version (released in the U.S. in 1950), directed by Ivan Barnett, which I prefer to Corman's version with Price, although Corman's version is somewhat truer to Poe and more highly regarded. But the Barnett version (almost Dreyer-like -- so many creepy images) gave me nightmares as a child. I wonder if this thread is confusing sexual orientation with dated gender preferences. E.g. just because a man loves "beautiful things" doesn't mean he is gay. Just because a women plays sports or fishes and hunts doesn't mean she is a lesbian. Sometimes I was questioned if I was gay because I had a picture of Judy Garland on my wall. No, I just happen to love Judy Garland! I really love the direction gender neutral is taking us; I.e. that behaviors and tastes no longer need to be specific to one's gender. But is it 'a bit extreme' today? Based on my personal experience these non-traditional gender roles (or what I call dated ones), can be found a lot more frequently with the younger generation (say under 40), than they were back, say, 25 or 30 years ago. Never thought about this but Roderick Usher does seem a bit gay-I love the way he says "merchant of flesh"
"You meet affluent men around here, and they're not all effeminate either, some of them are really manly & you'd never dream that they were queer, not from the look of 'em. But I can always tell 'cos they've all got LPs of Judy Garland."